Live updates as Roy Hodgson reveals his 23-man squad for the World Cup. We are an hour away from learning the identities of the 23 men who will represent England at the World Cup. Roy Hodgson is revealing his squad at the Luton factory of England sponsors Vauxhall - wouldn't Wembley have been more appropriate? Ashley Cole has announced his retirement from international football after being told he is not part of Hodgson's plans. The Independent reports West Ham striker Andy Carroll prefers a holiday in Dubai to a stand-by. Norwich keeper John Ruddy will not be part of the squad, according to Sky Sports, with Roy Hodgson preferring Fraser Forster. Yes, if you believe Nick Collins on Sky Sports News. He reports Saints striker Rickie Lambert and veteran Frank Lampard are likely to be included in the squad. Enjoying #Hodgson 's #England team before it's been announced: no Cole and Carrick, correct decisions for me. England latest: Five Liverpool players to be named in the 23-man squad with a sixth - Jon Flanagan - to be named as a standby. More omissions. BBC Sport reports Michael Carrick will not be part of the squad. Spurs full-back Kyle Walker also misses out. Their World Cup campaign gets underway on 14 June in Manaus against Italy. Opinion divided on Twitter over the reported inclusion of Frank Lampard. Everyone beefing out #Lampard he's been one of our best players at past 2 tournaments, and you know he's got goals in him! Press Assocation's Simon Peach reports good news for Saints fans. 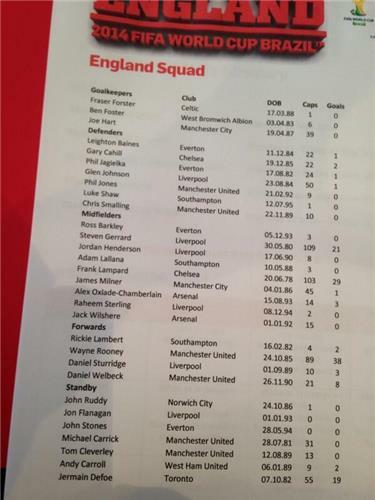 Just had it confirmed that #SaintsFC trio Rickie Lambert, Adam Lallana & Luke Shaw are all in the 23-man England squad. Ashley Cole has lost his pace, but for his experience at the top level, he could have been an option. Has Baines secured his place? Brave choice by Roy, though. Hodgson on Ross Barkley: "He's a very, very exciting talent. He has a fantastic future in front of him. I would hope that people are realistic in their expectations of him." Is your squad a family saloon or a sports car, Roy? "I don't know but I'm really pleased to drive it"
Hodgson on his captain: Steven is extremely mentally strong. He loves Liverpool and he loves England. I have no doubt he'll be as good as ever in this World Cup." Hodgson on his 23: "It has changed but a large body of the squad has been clear for a long period of time. Nothing has changed in the last four weeks. There have been no knee jerk reactions." 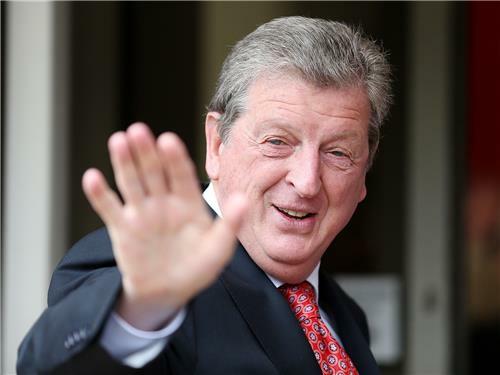 Hodgson on whether he wanted Cole to go on standby: "I'm going to keep that conversation to myself. I don't really want to go into it. It was a private conversation. It was a difficult conversation." And with that, it's over. Will Roy's 23 exceed expectations or produce a now-familiar limp effort on the game's biggest stage. We'll have to wait until 14 June to find out. Hart, Forster, Foster, Johnson, Jones, Cahill, Jagielka, Smalling, Baines, Shaw, Gerrard (c), Wilshere, Henderson, Lampard, Milner, Barkley, Lallana, Sterling, Oxlade-Chamberlain, Rooney, Sturridge, Welbeck, Lambert. Carroll, Stones, Ruddy, Defoe, Carrick, Cleverley, Flanagan. Thanks for joining us this afternoon.